bl.uk > Online Gallery Home	> Online exhibitions	> Asia, Pacific and Africa Collections	> The Bazar. Photograph of a village scene in Bengal, from an Album of Miscellaneous views in India, taken in the 1860s. 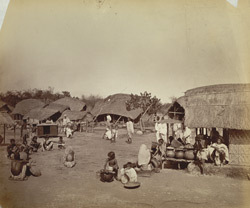 This shows a typical village scene with a small bazaar with thatched huts and villagers sitting around.